Ursula Martin never thought she would walk 3700 miles around Wales, but following a cancer diagnosis it seemed like the only reasonable thing to do. In 17 months, she traversed beaches and mountains, farms and urban sprawl. She received unimaginable support - people offered beds, food, cups of tea, donated to her chosen charities. Walking Wales rooted her in the country and in herself; her account of the physical and mental challenges painting a unique portrait of the natural landscape of a country and its people. In 2011 she was diagnosed with ovarian cancer, stage 1A. By 2012, following surgery and follow-up treatment she was feeling very lucky. Lack of knowledge about the symptoms of this illness is a major factor in late diagnosis and therefore a lowered survival rate. Ursula Martin decided that, starting in March 2014, she would walk from her home in Machynlleth to a hospital appointment in Bristol then, during the six months before the next appointment, walk around, through, in, under and over Wales, in all its wonderful variation before returning to Bristol. Then, after the second hospital visit, she would walk north, following the river Wye up to the mountain Plynlimon and over, home to Machynlleth. 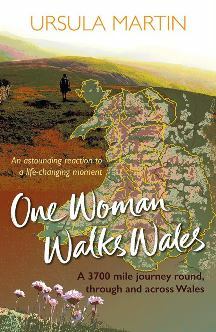 Win yourself a signed copy and be inspired to enjoy the Welsh countryside or maybe do your own walk for charity. On our Pembrokeshire walking holiday on the Welsh coast, you can walk to St Non's Bay. St Non is buried in Dirinon in Brittany, but the Chapel of St Non in Pembroke marks the place where she gave birth to which more famous Saint?